This slim volume packs a punch above well above its 92 page length would initially lead one to imagine. I read it at one go; pondering and wondering, arguing [with myself, with the book and with the author], and liking it. Actually liking it a lot. Ostensibly this book is about a mediocre book reviewer, Alexander Baddeley, who is obsessed with a well-regarded poet who, as it happens is a recluse. So, “A” our protagonist and almost certainly a stand-in for Alexis decides to track the poet down and succeeds. Thenceforth things get interesting. The poet, Avery Andrews [also “A”], is not disturbed by being stalked and found. In fact he welcomes it and [spoiler alert] informs Alexander that he is happy to meet his “assassin”. But first Avery wishes to introduce Alexander to his “muse”. Previous to this point in the narrative we entered terra fantastika. A manner of writing now mainstream everywhere in the developed world, including Canada; but which, in Canada, gets little to no respect. Alexis employs a unique mix of fantasy, fable, magic realism and meta-textuality to explore the sources of inspiration and the creative impulse. The crisp prose belies a penetrating inquest. Despite the spare & realistic trappings of the narrative, one can scarcely imagine such a work written in the strict realist mode beloved by exponents of the CanLit canon. So we now have the two main concerns of “A”: the well-springs of creativity and the inherent futility of a literature [and its exponents] which eschews and belittles any writing mode other than its own fossilized genre. Alexis relishes poking fun at the CanLit genre and and some of its leading lights. (I must admit that perhaps I enjoyed these passages more than I ought to have. Oh well.) Fascinatingly, although Alexis is embraced by CanLit “respectability”, he clearly chafes at the restraints the genre attempts to impose. In fact, here, he writes as an outsider and writes in a mode calculated to unsettle the canon keepers. Highly recommended. There's a long waiting list at the library to borrow Fifteen Dogs, so I thought I'd try reading one of Alexis' earlier works in the meantime. I am now more excited to read FD than ever. "A" blew me away. All of 72 pages, and I felt I knew these characters, and inhabited their world. The opening chapter was my favourite: the description of Baddeley and his little, superficial life was excellent. I was awestruck by word choices like "glacially perfect," or "the small world lodged in the throat of" a restaurant.His descriptions of the Canadian literary scene were most entertaining, and I'm guessing might have pissed off a few people. The imagining of the source of a writer's inspiration was frightening and fascinating. I have one, admittedly unimportant, criticism: I hate the cover. I know, I know: Never judge a book by it's cover. But I find this one terribly misleading. When I first saw it, I thought the library had held the wrong book. 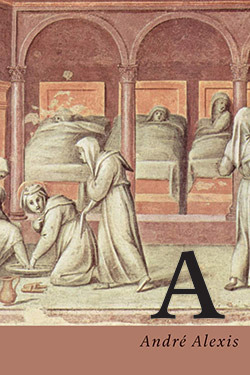 Why would a novel about the source of an artist's inspiration, set in modern-day Toronto, have a strange image from a Medieval hospital on the cover? The hospital is the only part of the image that's relevant. With Alexis' current success, hopefully the publisher will re-print this excellent novella with a more enticing and modern-looking cover. Intriguing. “A” is a gem that can be read in one sitting. A delightfully provocative attempt to uncover the most mysterious of arts: creative writing and its elusive companion, inspiration. It is the story of a doleful book reviewer named Alexander Baddeley whose singular passion is following the work of Avery Andrews, a reclusive and mythical poet. This leads Baddeley on a quest with a surprising outcome. His wanderings through the well known streets of Toronto, and the author’s rather naughty literary name dropping add to the shock value, the contrast between outward appearances versus inner angst. I like the author’s neat approach to the concept of God, (Baddeley is advised that the word has a trillion meanings, and “I am and I am not what you mean by it.”) Author Alexis eloquently describes the compulsion to write, never mind what, “novel, fable, poem, recipe… it was all the same.” Along with the disappointment that comes later, when the character measures what he’s written against his own ideals.For all it’s suffering, this is a strangely comforting tale. I am not sure I liked this book. I feel like this book hasn't left me with any questions, other than "what was this story about? "I didn't really understand the need for "God" in the story. I kind of thought the story was about finding your own ability to write, but for some reason it came from "God". There was also a lot of referencing the the literaity of Toronto which was maybe to ground the book in realism. I found the writing to be excellent. It is really what pulled me though the story. Meditation on inspiration and the act of literary creation. Critic meets the poet/hero and the veil is dropped changing both lives. Interesting read. It was Ok, know Toronto so know where he speaks and it is accurate. Very short and really wondered why he bothered. Language was good. This is my first time reading AA, and I really enjoyed it. For anyone IN the Toronto Lit scene, this is a great little novella featuring a cast of familiar characters. More to come in a while. André Alexis - André Alexis was born in Trinidad and grew up in Canada. His most recent novel, Fifteen Dogs, won the 2015 Scotiabank Giller Prize and the Rogers Writers' Trust Fiction Prize. His debut novel, Childhood, won the Books in Canada First Novel Award, the Trillium Book Award, and was shortlisted for the Giller Prize and the Writers' Trust Fiction Prize. His other books include Pastoral (nominated for the Rogers Writers' Trust Fiction Prize), Asylum, Beauty and Sadness, Ingrid & the Wolf, Despair and Other Stories of Ottawa and Lambton, Kent and Other Vistas: A Play.